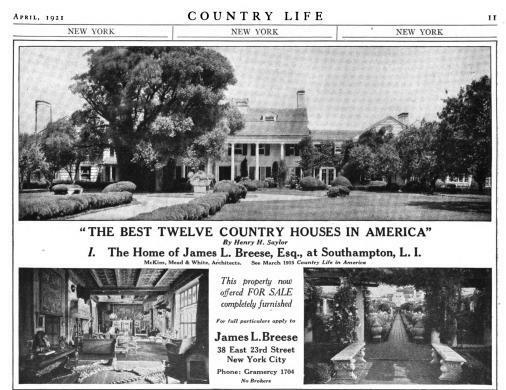 An advertisement for 'The Orchard', the James L. Breese estate designed by McKim, Mead & White between 1898-1907 in Southampton. Click HERE for more on 'The Orchard'. I remember the advertisements at the time of the circa 1980 conversion to condos showing floor plans. What is the current opinion? All in all, was the adaptation considered a success? I get winded just looking at that place (“Now, where did I leave my spectacles?”); but I’m grateful it’s there for me to see & get winded over. & in the world of being converted into condos this is not terrible … at least on the exterior … at least in my opinion. What do you think Classicist? I’m a little surprised it was considered one of the 12 best country houses in America; I’m sure the cost of maintenance (i.e. all that exterior white paint) was not part of the judging. But – again, my opinion – by April 1921 there were several other wonderful country houses in the US that would have bumped ‘The Orchard’ off my list. Zach, are you eventually going to show us the list of the ’12 Best’? It has been years since I have passed it. I thought the parking could have been better handled with landscaping, but not bad, all in all. As I remember, the divisions were sensitive, at least in the major rooms. It is interesting that there might have possibly been some interest in the house as a single family home just a few years later as the so-called "invasion of the new rich" found the Hamptons, and as families with young children moved there full-time after 9/11. What are the other eleven??? Henry H. Saylor, "The Best Twelve Houses in America, VII: La Chiquita, the Home of Francis T. Underhill at Santa Barbara, California," Country Life in America 29, no. 1 (Nov. 1915), pp. 27 — 30. La Chiquita is a California bungalow; although Underhill was an East Coast Oyster Bay guy - having co-founded the National Horse Show at Madison Square Gardens in 1883. Devoted, I tend to agree that the condominium conversion, all things considered, is not too bad at all---far better than many, in fact.